Candid remarks on b(5). 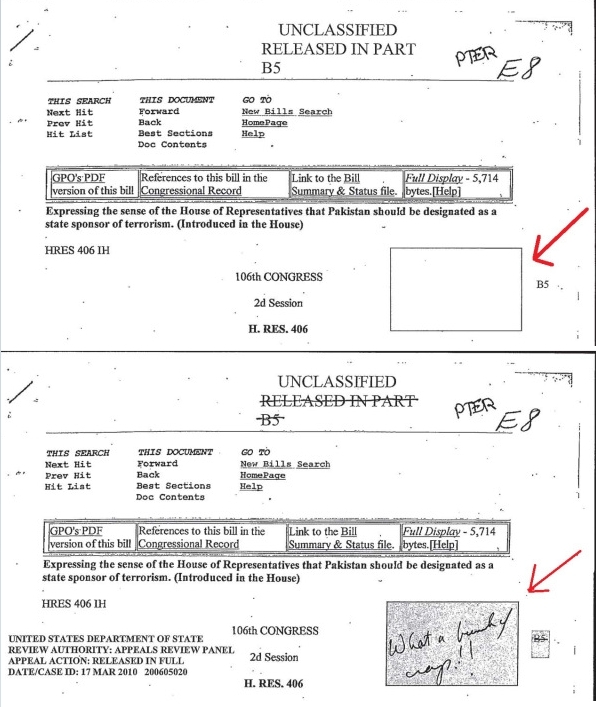 Documents from The Department of State was Hiding This . Something troubling happened this Sunshine Week. At the 16th Annual National Freedom of Information Day at the Newseum’s Knight Conference Center, former White House Office of Information and Regulatory Affairs Administrator Cass Sunstein accepted the prestigious James Madison Award on behalf of the five-member President’s Review Group on Intelligence and Communications Technologies which recommended the end of bulk telephone metadata collection. Then, Sunstein used his acceptance speech for the James Madison Award –which recognized those who “championed, protected and promoted public access to government information and the public’s right to know”– to invoke the memories of Madison and Thomas Jefferson to argue to a roomful of openness activists that they should support continued government secrecy. Citing the debate during closed sessions of the Constitutional Convention more than 225 years ago,1 Sunstein appealed for the continued need to protect the “deliberative process.” Government agencies are increasingly citing this same “deliberative process” to trigger a Freedom of Information Act exemption –b(5)– that allows them to withhold any “interagency or intra-agency communication,” as well as any agency-claimed “draft,” from the public. This incredibly large cutout is often called the “withhold it because you want to” exemption. The use of this “withhold it because you want to” exemption has skyrocketed over the past two years of the Obama administration. As a result, transparency advocates, including the National Security Archive, as well as members of House and Senate committees responsible for FOIA have targeted b(5) reform as a vital inclusion to any FOIA bill that passes Congress. But perhaps I am just getting wound up. Maybe Cass Sunstein was not using the one week that the US celebrates openness to channel a White House message that meaningful reform to the FOIA won’t happen on its watch. Maybe he was using Madison and Jefferson on his own volition to “nudge” us away from attempting pro-transparency reform. At any rate, as soon as I heard Sunstein’s Madison Award acceptance speech calling for continued (actually, increasing) secrecy, I endeavored to try and make the case why b(5) reform will be the most important FOIA fight over the next few years. 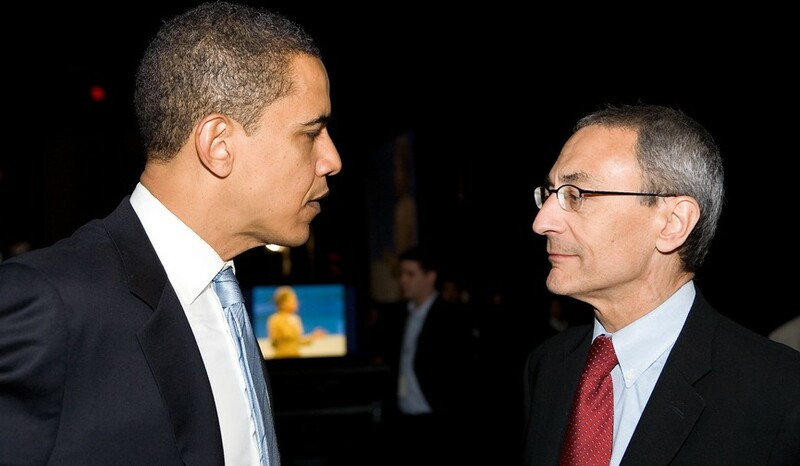 During the Obama administration’s third Sunshine Week, his FOIA point man, Steve Crowley pointed to the falling use of the b(5) exemption as proof that the administration really was working to “figure out where we can disclose information” and cited the b(5) dip as a FOIA success stemming from President Obama’s and Attorney General Holder’s instructions for agencies to operate with ” a presumption in favor of disclosure” with respect to FOIA. Not citing b(5) during Sunshine Week anymore. Chart created by Lauren Harper. But the Obama administration is certainly not making that argument anymore. According to stats compiled by the Associated Press, b(5) use is at an all time high, used 81,752 times in 2013 (applied to 12 percent of all of 2013’s processed requests) to deny information. 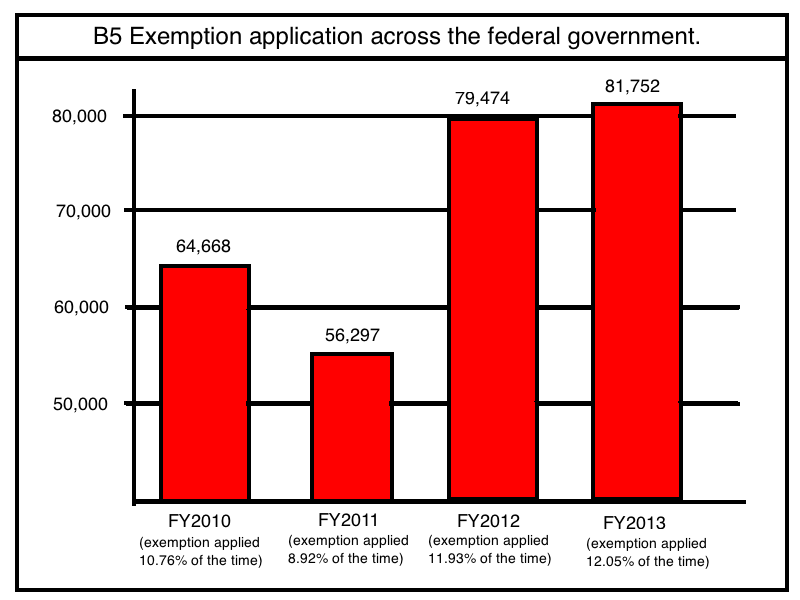 This skyrocketing use of exemption b(5) has proven that a legislative fix is needed; the White House has been unable to get agencies to comply with it’s clear instructions on FOIA. The Department of Justice’s use of b(5) to censor dozens of pages of a candid history of Nazi-hunting (and Nazi-protecting) by the U.S. government to such a self-defeating extent that former officials leaked the entire document to the New York Times, instead of fulfilling a Freedom of Information request. 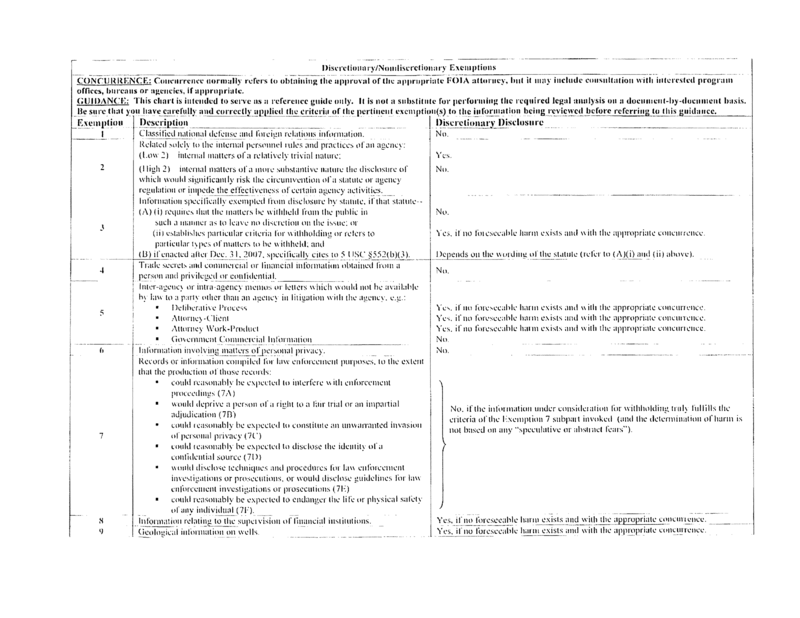 The National Security Archive submitted a FOIA request for the history of the Office of Special Investigations in November 2009, only to be denied by the Justice Department on grounds that the document –although completed in 2006 and never revised since then– was only a draft and was “predecisional” and therefore withholdable under the b(5) exemption to the FOIA. When our appeal met no positive response –despite President Obama’s and Attorney General Holder’s clear guidance on FOIA –the Archive filed suit. Only after the lawsuit was filed did the Justice Department begin to “process” the document for release –which meant the wholesale application of b(5) “white-out” to sections of the document – deleting even the “personal opinions” of Congresswoman Liz Holtzman as she had expressed them in public as well as to the author of the history. Fortunately, a Department of Justice employee leaked a copy of this history to the public. See here to judge for yourself if the sections the DOJ “withheld because it wanted to” were justified. Trust us. You don’t have to read it for yourselves. The CIA, supported by the Department of Justice, is currently using the b(5) exemption to keep secret its history of the 1961 Bay of Pigs Invasion, arguing that it’s release “could confuse the public.” As Judge for the US Court of Appeals Judith Rogers explained to U.S. Attorney Mitchell P. Zeff, the CIA and DOJ are attempting to “seek ad infinitum protection of drafts” when the FOIA is actually a disclosure statute and exemptions must be narrowly drawn. Muckrock’s Shawn Muscrave has reported that The Federal Elections Commission attempted to argue that it’s own guidance on when to apply b(5) is itself exempt from release under b(5) –even though it had already been posted on the FEC’s website. Muckrock has also compiled an extremely useful list of agencies’ b(5) guides. A protracted and wholly unnecessary fight over b(5) delayed the release of historic Henry Kissinger notes of telephone conversations, “telcons,” for seven years. In 2007, in response to a FOIA request filed in 2001, the State Department denied over 800 historic telcons on FOIA (b) (5) pre-decisional grounds. Finally, in 2013 the Department of State released a portion of them, including Kissinger’s conversations with government and former officials during the Ford Administration. As interesting as the telcons are, they contain no information that ought to have been withheld. Unquestionably they include candid discussion of issues and personalities and inter-government decision-making generally, but that provides no excuse for agencies to apply the b(5) “pre-decisional” FOIA exemption to federal records produced decades ago. Glad you picked that fight? 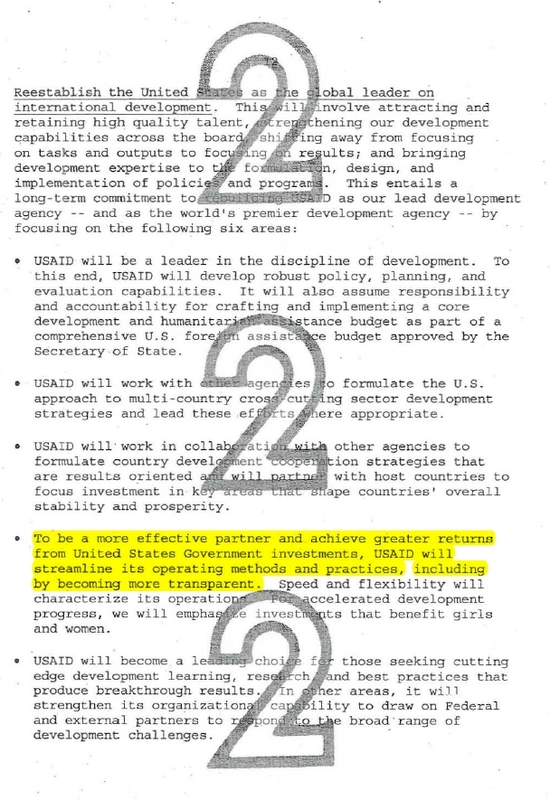 Presidential Policy Directive on Foreign Aid, pledging transparency. Via Center for Effective Government FOIA lawsuit. Last year, the Department of State, and the U.S. Agency for International Development argued, ironically, to a federal judge that a Presidential Policy Directive instituting increased aid transparency should be withheld from the public (even though the Administration had released a “fact sheet” largely disclosing what was in the PPD). The Center for Effective Government was forced to file a FOIA lawsuit, which it won. Most recently, CIA Director John Brennan’s wrote a document for Senator Dianne Feinstein laying out his reasons for why he believed the Senate Intelligence Committee’s 6,200 page report on the CIA’s torture program should remain classified. To ensure that his reasoning about why the CIA’s torture program should, itself, remain hidden from the public and FOIA, he was careful to make sure the first page had the marking: “Deliberative Process Privileged Document,” signalling to his FOIA shop he wanted it denied under the b(5) exemption. These are just a few of the most egregious examples of the b(5) “withhold it because you want to” that I could recall. If you have another example, add it in the comments. B(5) was initially conceived to prevent government employees from “working in a fish bowl,” to allow employees to give each other –and their supervisors– candid advice. These protections should and must remain. But, b(5) was cited 81,752 times last year, certainly not always to protect the flow of government employee ideas and positions. President Obama correctly stated that the principles behind the Freedom of Information Act prohibit the government from withholding information to prevent embarrassment, hide errors and failures, or because of speculative or abstract fears. But these are precisely the things the b(5) “withhold it because you want” exemption is being used to hide more and more. Agency restraint has not worked. Proclamations from the President and Attorney General have not worked. It is time for a Legislative correction to the Freedom of Information Act. Openthegovernment.org’s Amy Bennett opened her Senate Judiciary Committee testimony this Sunshine Week by stating that the open government community strongly supports b(5) reform to the Freedom of Information Act. The two-part fix she proposed will preserve the ability for government employees to give candid advice, while preventing the use of b(5) to withhold information that the public should have access to. Another FOIA champion, Ranking Member Chuck Grassley, also signaled his willingness to continue to cooperate to produce legislation which reforms FOIA. Work between Senate Judiciary Committee Staff and open government groups is underway. The House has already unanimously passed a FOIA bill co-written by the Chairman of the House Oversight Committee Darrell Issa and Ranking Member Elijah Cummings, which takes a step to stem the overuse of exemption b(5). The House-passed bill codifies that an agencies may only withhold information if it “reasonably foresees that disclosure would cause specific identifiable harm to an interest protected by an exemption, or if disclosure is prohibited by law.” Unfortunately, I believe that since agencies are already ignoring the President and Attorney General’s instruction, they will likely also ignore this part of the statute. A b(5) time limit and remedy for judicial review, as Amy Bennett testified, is the best fix. Miriam Nisbet, Director of the FOIA Ombuds Office, the Office of Government Information Services, also spoke in favor or increased disclosure of information which could technically be withheld under b(5). Speaking at the Collaboration on Government Secrecy’s Freedom of Information Day at American University Washington College of Law. She called b(5) her “favorite exemption” because her Ombuds Office is often successful in getting more information released that agencies initially withheld under b(5). No correction for the record? However, she is contradicted by her own agency’s guidance circulated after her own Attorney General called for more discretionary releases, which states that both “attorney work product” and “attorney client information” are subject to discretionary release. Likewise, the Department of Justice’s own FOIA guide states (pages 689-690): “The universal considerations to take into account in considering whether to make a discretionary release of information that otherwise could be withheld under the deliberative process privilege are the sensitivity of the record’s contents and the age of the document. Records protected by other Exemption 5 privileges [ed: including “attorney work product” an “attorney client” information] can be the subjects of discretionary release as well.” (Emphasis added.) Such confusion within the DOJ OIP about when the b(5) exemption should be used demonstrates, again, the need for a Legislative fix. I’d like to end Sunshine Week with a bit of good news. There is one other high-ranking backer of b(5) reform. 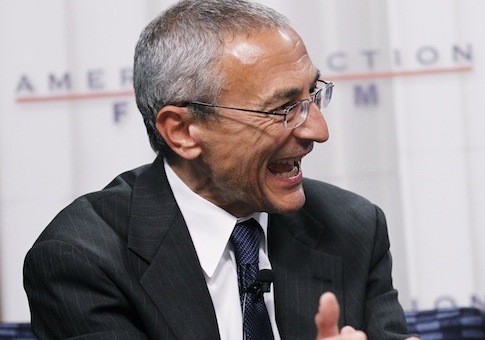 That is Special Advisor to the President John Podesta, brought back into the White house last December. His FOIA bona fides are impressive. In fact, the first time I ever heard the phrase “withhold it because you want to exemption” was when he coined it, during his Sunshine Week 2011 testimony before the Senate Judiciary Committee calling for reform to b(5) FOIA exemption. Mr. Podesta, please pass this blog post along to Cass Sunstein, and explain to the White House why opposing b(5) reform is a bad idea. ← Vladimir Channels the Gipper: Putin’s rationale for invading Crimea sounds a lot like Reagan’s for invading Grenada. Great and timely post. Nate. The CIA very recently denied in full, a FOIA request for a historical study on the World War II Office of Strategic Services on the basis of B(5) exemption only. I am aware from the author of the study, that it is based in large part on the declassified OSS archival record at the National Archives Record Group 226. The only exemption offered was b(5), no operational exemption etc.. I guess that the Agency could argue that this study was deliberative, or that it contains information contrasting the current functions of the particular Agency component that I am researching with its wartime predecessor. It does strike me as “withholding because we want to”. They won’t even release the reasonably segregable portions of the study that are based on the already declassified NARA records. Egregious (b)(5) stories update: The Free Beacon reported that the Department of Veterans Affairs blocked the release of the names of hospitals where 19 veterans died because of delays in medical screenings under the (b)(5) exemption [http://freebeacon.com/issues/va-hides-names-of-hospitals-where-vets-died-from-delays/]; Muckrock revealed that the Bureau of Prisons refused to release the names of private companies that contract for access to prison labor under the discretionary exemption [https://www.muckrock.com/news/archives/2014/mar/27/bureau-prisons-refuses-name-businesses-employ-pris/]; and American University’s Washington College of Law Executive Director, Dan Metcalfe, pointed out to us that the New York Times reported in 2003 that the Department of Justice heavily redacted a report that harshly criticized its workplace diversity efforts with (b)(5)[http://www.nytimes.com/2003/10/31/us/a-critical-study-minus-criticism.html]. Any more (b)(5) stories you guys can think of?? Yet another example of egregious (b)(5) usage: Huffington Post reporter Ryan. J. Reilly just shared a TwitPic of all 10 *unclassified* opinions authored by the DOJ’s Office of Legal Counsel in 2013 with 9 out of 10 opinions redacted. [https://twitter.com/ryanjreilly/status/459349265916395520/photo/1]. Keep ’em coming! FOIA needs to be seriously improved. My son, an American teacher, was murdered in China in 2005 (www.russellcase.net) and our family is suing under FOIA to get withheld records released. The b5 trick has been pulled again and again — this is what they do to make filers go into complete exhaustion and give up. Until this is reformed, FOIA will continue to be of questionable use.